For much of Russia’s post-Soviet history, terrorism threats came from militants from the North Caucasus. Today the situation is different. 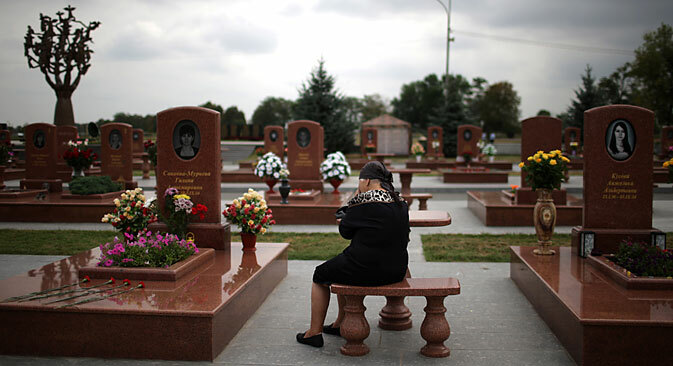 Ten years have passed since the most horrific terrorist attack in modern Russian history, when Chechen separatists took 1,100 people hostage in a school in the North Ossetian town of Beslan between Sept. 1-3, 2004. In the operation to end the siege, 334 hostages were killed, most of them children. Today, the character of terrorism in Russia has changed and most Russians do not fear an attack on this scale. According to a recent survey by the All-Russia Public Opinion Center (VTsIOM), only 13 percent of Russians consider terrorism to be a major concern. In 2004, 88 percent of Russians feared a terrorist attack. However, the threat of terrorist acts in Russia remains a concern. In the 1990s and the early 2000s, separatists from the North Caucasus republics of Chechnya, Dagestan and Ingushetia carried out most of the terrorist attacks in Russia. Led by men such as Shamil Basayev and Doku Umarov, these militants declared their goal to create an Islamic state in the Russian North Caucasus, a region consisting of six semi-autonomous regions populated by distinct ethnic groups and mostly practicing a form of Sufi Islam. During the two wars Russia fought in Chechnya in the 1990s, the militants’ primary goal was to create a state separate from Russia. In the 2000s, however, the militant groups changed character and took on more explicitly religious goals and an ideology that shared more with the militant Islam of groups such as Al-Qaeda. This change in ideology is reflected in the names the insurgency used for itself. In the 1990s, the dominant group among the separatists was known as the Chechen Republic of Ichkeria. Later, the primary separatists movement was known as the Caucasus Emirate. Terrorist activity has decreased in the North Caucasus for several reasons according to Nikolai Silayev, a senior researcher at the Center for Caucasian Studies at the Moscow State Institute of International Relations. According to Alexander Bortnikov, head of the Federal Security Service, in the first six months of 2014, 130 militants were killed, including 21 ringleaders, and more than 160 rebel hideouts and arms caches were found and destroyed. These numbers are mostly because of the intense activity in securing the North Caucasus prior to the Winter Games. Silayev said that the Russian government has also been successful using less violent methods. “The work of special commissions that hold talks with rebels seeking to convince them to give up fighting and return to a peaceful life has also been useful,” he said. Some former militants have also taken positions in the government of Chechen President Ramzan Kadyrov, a Kremlin loyalist who has made it clear that he sees the future of Chechnya as part of the Russian Federation rather than as an independent state. International events have also played a role in the changing nature of the terrorist threat in Russia. As conflict between national governments and Islamic radicals has heated up in the Middle East, “many of the most zealous militants have gone to fight in Syria or Iraq,” Silayev said. The movement of militants to the Middle East, however, has created a different but no less serious cause for concern. Some experts fear that these fighters could return to the North Caucasus after a stint with Al-Qaeda or the Islamic State and use their experience to destabilize the region once again. There is a fear that increased conflict between Islamic radicals and government forces in Central Asia could radicalize Russia’s Muslim community. In November 2013, a Levada Center survey showed that Muslims represented about 7 percent of Russia’s population, but that the number of Muslims in Russia is increasing partially because of immigration from Central Asia. Russia does not require visas for Central Asians, so some experts worry that radical Islamists — some of whom honed their fighting skills in Afghanistan — could enter Russia through these countries. The most serious threat to Russia today, however, is not actions by Islamic militants from the North Caucasus or Central Asia, but rather a further radicalization of the situation in Ukraine. In August, Russian Prosecutor-General Yuri Chaika said ongoing “political, nationalistic processes are seriously affecting the security situation in regions of three federal districts.” All of these districts face the problems of terrorist threats, arms trafficking and uncontrolled immigration, he added. Even if Ukrainian President Petro Poroshenko reaches an agreement with the major pro-autonomy militias operating in the eastern part of the country and brings an end to military activity in the region, separatist groups could continue to be active. At a press conference on Aug. 24, Alexander Zakharchenko, the prime minister of the self-declared Donetsk People’s Republic, said that his group would stop at nothing short of an independent state. “We want independence. Federalization does not suit us,” Zakharchenko told reporters. Alexander Brod, the director of the Moscow Bureau for Human Rights has also pointed out that there are a number of pro-Ukrainian paramilitary groups operating in eastern Ukraine. “All those non-state structures starting from late last year have been viewing Russia as their enemy, all but calling for occupying its border territories,” said Brod. The porous border between Russia and Ukraine could allow militants who participated in the conflicts in the areas around Donetsk and Lugansk to travel between the countries and work to destabilize the region even after fighting has officially ceased. The threat is a particularly serious one given the types of weapons present in the border region and the inability of international organizations to gain access to the area. Gevorg Mirzayan is a political analyst for Expert Magazine and a research fellow of the U.S. and Canadian Studies Institute at the Russian Academy of Sciences.